One thing we love about art is how different and magnificent it can get – from a scale of large to small. 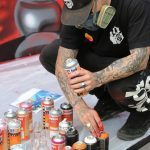 So when we saw iSteef’s work we were pretty impressed with his very original way of working. The summer showcase by Creative Debuts X Trapped in Zone One brought a whole host of artists down, but the live action you couldn’t ignore (and the massive pile of banana skins) was the mad banana art from @iSteef. 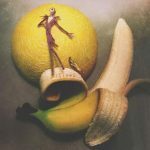 We’re all into something a little different and this amazing imagination has led to some art that is incredibly creative. 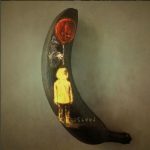 As well as bringing designs to life and carving the art, iSteef links up the colour of the skin and the physical banana into the designs to make a dynamic element with a real visual impact. It’s hard to pick, but a few of our personal favourites at Amigos Tequila Beer are definitely a toss-up between GOT inspired bits, intricate building/ landscapes from all around the globe and of course the AMIGOS BEER BANANA (check it). 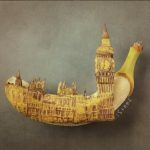 It was a combination of things really that made me tumble into the world of banana art. It happened about 6 years ago. My wife had been pushing me to use Instagram for while, saying it would be great for promoting my illustrations and comics that I’ve been doing in my spare time besides my work as a graphic designer. And just after lunchtime I wanted to experiment a bit with the app, try out the filters and such. But since I was at the office I didn’t really had anything fun or interesting to photograph. I then noticed I still had a banana left from lunch and figured it would make a fun picture if I just drew a little happy face on it. 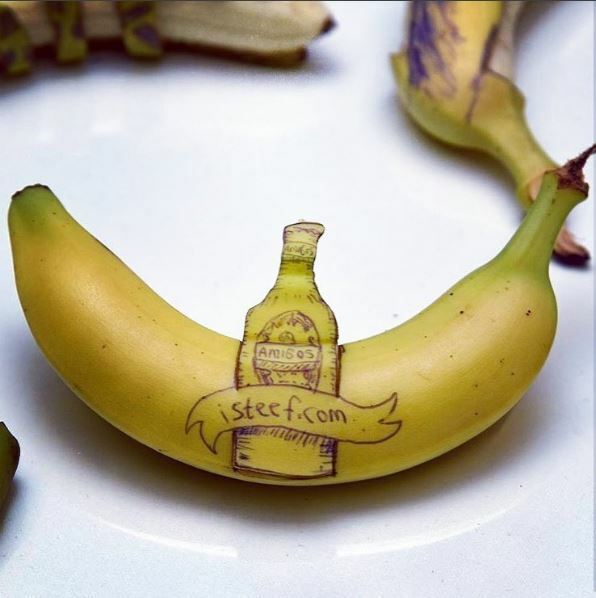 Discovering how pleasant it actually is to draw on a banana – there is just something about how smooth the ballpoint pen flows on the structure of the banana peel- I made another ‘fruitdoodle’, as I like to call them, the next day. One with a grumpy face, for balance sake. 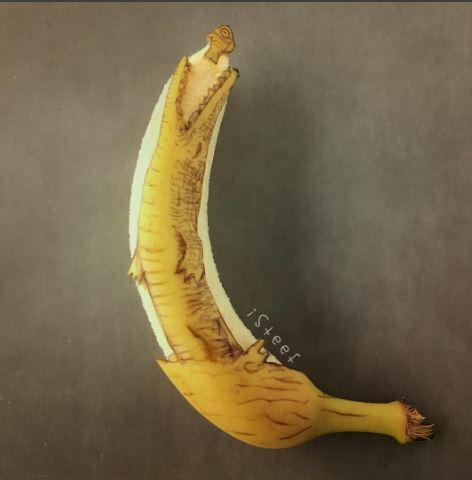 And after that I just kinda challenged myself to see what else I could come up with to draw on a banana, and I never stopped since. After a while I also noticed that I was getting more likes and attention for my drawings on bananas than my other stuff. 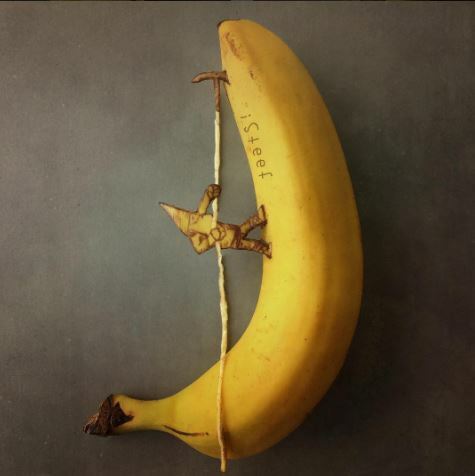 So instead of my other projects I gradually started to focus more and more on the banana art. 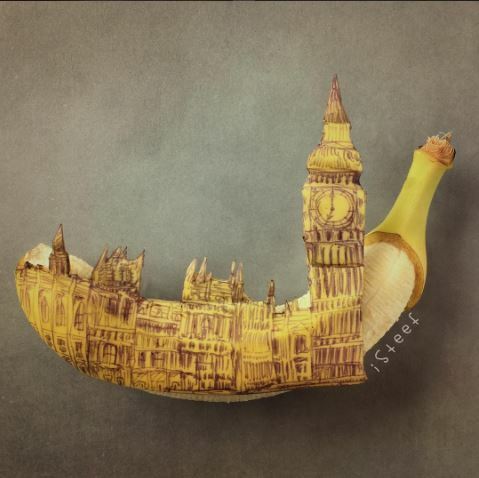 Sometimes just looking at a banana sparks an idea. Other times I’m inspired by the diversity of nature, all those different kind of animals and plants. I want to reflect the many levels of creativity found in nature with my own creations. Besides that I’m inspired by art in the form of movies, tv-series, music and classic paintings. You’ll might find me and work popping up in a documentary or two in the near future. There is an art book in the pipeline that will feature my fruitdoodles. I’ll be live fruitdoodling again in Germany somewhere in the coming months. And there is a good chance you might find my work on coming Creative Debuts exhibitions as well.